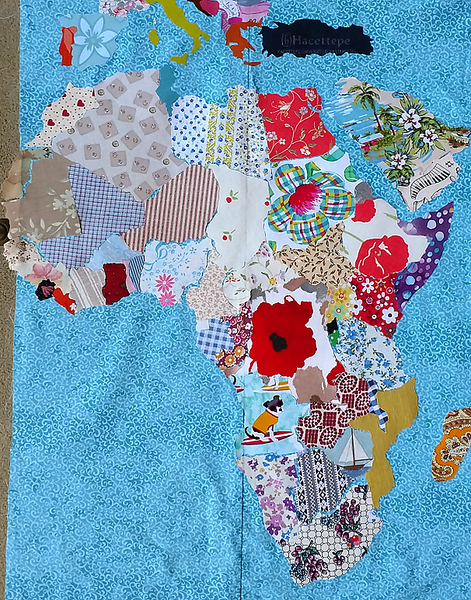 Postcrossing quilt: World map update! Africa is now complete! Time to move back to Europe, as soon as I get more fabrics from Postcrossers. Also Turkey is added (using fabric sent to me from that country - the pocket from medical scrubs!). Link to Really Big Image of the above. Most of Europe has been finished, but there's still central/eastern Europe to finish, plus the Middle East, before heading into Russia and Central Asia. This entry was originally posted at https://laridian.dreamwidth.org/2949850.html. Please comment there using OpenID.